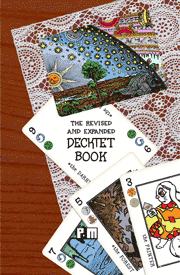 The Decktet Book book is your guide to a curious deck in six suits. Over 230 pages, covering the deck's history, both genuine and arcane; its structure, detailed in numerous charts and tables; games that exploit the unique features of the deck; suggestions for reading and interpreting the cards. The book combines text and rules that had previouly been available from disparate places with new material, presenting them together in a unified way. It includes over one hundred original and historical illustrations. There are rules for dozens of games in the book, including trick taking games, set collection games, auction games, resource management games, and more. Among these are two games that are not available anywhere else: Kingpins and Otgovorko. The book is available from Lulu in two versions. The electronic version is a PDF of the book. It is not protected by DRM, because I don't want to get in the way of your using it. However, the book is not free; if you buy the PDF, please don't pass it around indiscriminately on the internet. There is also an Update. It is formatted for printing two-up on 8.5x11 paper, but it will scale gracefully to A4. It is less than elegant, but it's a cheap way to get just the rules changes and new games if you already own the first edition.